Marcos Yánez is swiping through a series of high-quality photos on his phone. In one, he chugs a bottle of water. In another, it’s raining and he’s running up a steep incline on the side of a highway. The Alaska Range towers in the background. The white lettering on his orange rain jacket reads Alaska #RunforLeucemia. Names of sponsors run down the sleeve. Yánez just finished the last leg of a 300-kilometer run yesterday, and he still sounds tired. “Today I’m exhausted. I’m really exhausted because it was five stages,” Yánez said. “Every day I had to run over 50 kilometers. In total, Yánez ran around 187 miles, in just five days. And the terrain was anything but flat. Yánez started at Eklutna Lake outside of Palmer and ended his last leg outside of Healy, near Denali National Park. He ran up and down mountains in between. Yánez was running to raise awareness for the bone marrow donation registry. Bone marrow transplants have revolutionized the treatment of blood cancers like leukemia and lymphoma. For a little over 30 years, the National Marrow Donor Program through the Be the Match Registry, has been collecting cheek swabs from potential donors. But the registry still lacks diversity and numbers. Perfect matches are hard to make, and many of the patients who require a transplant, never receive it. Yánez is from the Canary Islands, which are owned by Spain, but for one of those legs he was joined by an Alaskan. Christy Youngblood is a 33-year-old lymphoma survivor. And Youngblood found the perfect person to do it with. Yánez’s father died from Leukemia in 2014. After that, he ran around 75 miles in Iceland to raise awareness for the bone marrow donation registry. And then in 2017, he came across Youngblood’s story online. They both loved running and cats. He’d lost his father and she’d recently lost her mother. He sent her a Facebook message telling her about his idea to run in Alaska and make a documentary. Youngblood was first diagnosed with lymphoma in 2016. Youngblood finished chemotherapy in early 2017, but after a few months, they thought the cancer was back and that she needed a bone marrow transplant. Luckily, Youngblood didn’t end up needing it, and a few months after finding out she was in remission, she decided to start running again. Training was exhausting. But when she got the message from Yánez, it inspired her to keep going. She ended up running over 30 miles with him, including up and down Mount Healy. Youngblood said people they met along the way wanted to learn more about the bone marrow donation process. Some even wanted to run with Yánez. 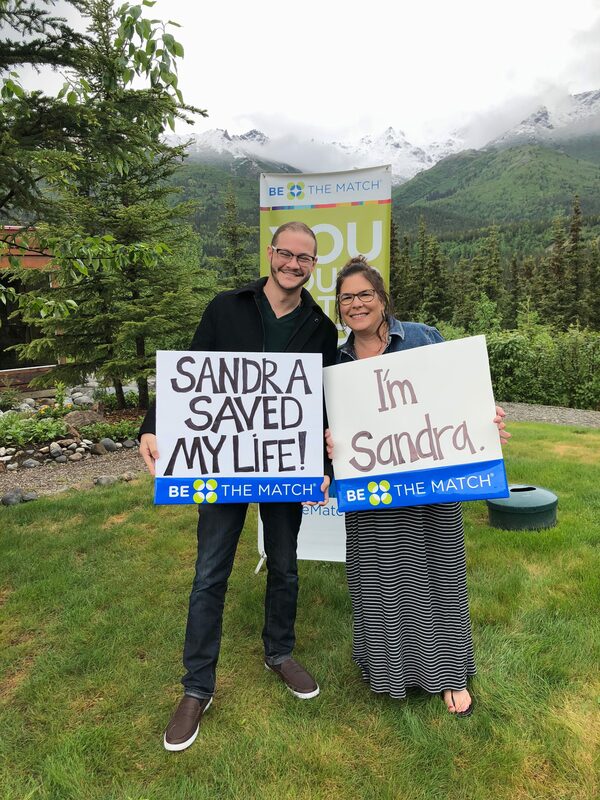 The Be the Match representative for Alaska, Tori Fairhurst, says people need the same tissue type to become marrow matches and because tissue types are inherited, that means they need similar ancestry. Certain groups, like Alaska Natives, are underrepresented on the registry. Eighty percent of the time it’s as simple as donating stem cells through a blood transfusion. The other 20 percent, they’re donating marrow to the patient. “The patient’s marrow would be destroyed and their perfectly matched donor’s cells would be given to them, and they would rebuild an immune system using the donor’s cells,” Fairhurst said. That’s exactly what Wasilla-resident SandraLynn Hinton did. About eight years after Hinton registered by ordering a swab kit online, 24-year-old Jonathon Leon was diagnosed with Leukemia and in need of a transplant. Hinton was a perfect match. Leon’s now in remission, and they met for the first time at the end of Yánez’s run. Leon and his family made the trip all the way from Miami to meet Hinton. “Thanks to her I’m alive breathing, so I had to come visit her in Alaska,” Leon said. Hinton said the donation process wasn’t as painful as many people think. Yánez said he’ll be back in Alaska to screen his documentary when it’s finished. His goal is to get 3,000 new donors on the registry, 10 for each kilometer he ran.